Rabbi Yakov Horowitz asked the Rosh Yeshiva to address this matter because many people who heard about our Purim program had asked to clarify the words of our chazal (sages) “Chayav einish l’besumei be’puria ad deloi yoda bein arur Haman l’baruch Mordechai” which loosely translated says, that one is obligated to drink [on Purim] until he cannot discern between Haman and Mordechai. “Chas v’shalom (Heaven forbid) that our Torah would consider getting drunk to be a mitzvah!” said Reb Shmuel. He explained that the word l’besumei is derived from the root word which means to sniff something – and said that this means that one should have only “a whiff” of drinking (wine only; he was clear to state). The Rosh Yeshiva also shed light on the words “ad deloi yoda bein arur Haman l’baruch Mordechai” and said that when one sings verses of a song when he is in a heightened state of simcha (joy) he occasionally will sing the verses in incorrect order – meaning that he will sing the verse of Arur Haman in the place of the verse of Baruch Mordechai. It is inconceivable, he stated, that this is to be taken to condone drunkenness – which is in direct contrast to the teachings of our Torah. While I applaud the efforts of the Rabbanim to promote safety and responsibility among our youth, this is nothing more than pure revisionism. To say that the simple meaning of chazal does not mean to drink on purim is patently false. If our Rabbonim can take such liberties, what is our argument against Reform rabbis? Thing is many big poskim disagree, although there are many achronim who pasken like reb shmuel others aurgue in just as strong a tone. Bottom line יש על מי לסמוך. Bottoms up! the halacha is to drink! how can we take a rabbi seiously if he changes halacha for political correctness. I am not saying children should get drunk and there are ways around it but be honest! You imply the Rabbonim in the past didnt know what they were talking about when they said it meant to get drunk literally. There is a big machlokes harishonim about this. It is not poshut. Maybe sniff refers to using an illegal substance to get “high“ ????? huh???? and this that the Rambam ad shyardeim mshiruso is against Torah??!!! Ch"V!!!! and the shulchan aruch??? and kama gdolim vtovim mimen........???!!!!!! and the Maasa of Rabba and Rav Zeira???!!!! Its one thing to say that you don't wan't to pasken that you must drink......!!!! but to erase everyone that does and 2,500 years of jewish history, that I just don't get, sorry!! Here here to 3 and 4. How do I defend this interpretation to my kid when i learn gemora with him? Kaminetsky Shlit’a pretty much emulates the Ben Ish Chai in what he is saying, see the Ben Ish Chai's perush on the Megilla. Additionally in today's lifestyle, getting drunk where you cannot discern the many hazards of modern life, is downright dangerous. Ushmartem es nafshoseichem should be considered. Every year we hear of needless tragic incidences. What kind of example are you setting for your children????? Is that what you consider responsible adults? Try this....since we are not supposed to be used to imbibing in yayin and mashkeh one or two glasses of wine should be enough to make us feel shiker but not necessarily be shiker. It is supposed to make you feel an altered or hightened sense of simcha or relaxation. It doesn't mean that you actually have to be dead drunk or throwing up drunk. Actually it is not revisionism it is FINALLY being accountable and responsible and interpreting the Torah correctly and not giving people an all out excuse to get drunk and make fools of themselves as well as throwing up in other people's homes. Actually the halacha is to "drink wine at the seudah". That never changed. Chuchum, why not buy your wife some roses for all her hard work and take some time to smell the roses! Get real. Modern life isn't more dangerous than in ancient times. Today a drunk can be killed driving, yesterday by falling off a horse. If you're inebriated, drive neither a car nor horse. I'm glad you enjoy getting drunk. A couple of years ago there were some folks in my neighborhood who were so drunk that they passed out after vomiting all over their host's table. Hatzolah had to be called to take them to the hospital. These were allegedly "responsible" adults who "enjoyed getting drunk". I am not m'kaneh you dissenters of one of the preeminent g'dolay ha'dor!!! Yes, and every Succos people are injured by collapsing decks. there are also People regularly injured in house fires on Channukah. Are not those also tragic? Should we stop building succahs and lighting Channukah lecht? I have the highest regard for R' Kaminetsky but he is swimming upstream against a flood of earlier and greater poskim. “ huh???? and this that the Rambam ad shyardeim mshiruso is against Torah??!!! Ch"V!!!! I get the feeling that this distiguished Rosh Yeshiva had intentions to just keep his Bochurim safe, and his "uptaich" of the Chazal was instructional for his bochurim - to drink responsibly and to a minimum. In today's day and age, and yes take into account the concept of yeridas hadoros, good frum bochurim in the year 2010 in general don't know how to act and often stray negatively when in a drunken stupor. When yidden, in generations gone by, got drunk on Purim it was a completely different scenario. They would dance with all their hearts in holiness and simcha and didn't have the dangers of drunk driving. This is perhaps a minhag that we should NOT try to fulfill to the maximum- especially our heiligeh yeshiva bochurim! Bochurim have been gravely injured and R"L killed because of drinking too much on Purim. That said, the Rosh Yeshiva's pshat isn't one too hard to hear. Afterall the mitzvah of U'Shmartem Me'od Es Nafshoseichem is a mitzvah on Purim too - and it's De'oraysa! All tzdikim and rabnim and klall yishreal they Didn't leren the pshat like he came out today. Some Didn't drink so much true . some did. Litfish chadish. And if you can't teach your kids the emes. Don't teach them with sheker. You can't bulid emes mit shker. Make sure teach them whole year Than all will be ok.not the wine purim is the problyn. farkert. he comes out saying Its avira. Can't belive it. bem'chilas kvod toras hagaon reb shmuel, chas lei lezar'ei de'avuha dishmuel to interpret a maamar chazal so allegorically. the pshuto shel mikra is that livasumei denotes inebriation. that is the literal definition of the word in aramaic. see sanhedrin 38a. If our Rabbonim can take such liberties, what is our argument against Reform rabbis? Simple. When "inserer" do it its a gevaldika chiddush. When reform rabbis do it its kefira. Without question, this falls into the category of "Eis La'asos LaShem". Kudos to Rabbi Kaminetsky for stepping up to the plate and having the fortitude to come out with this. Maybe VIN readers have not seen kids drunk lying in the street. Anyone that has seen this spectacle will decide to possibly have their kids risk not being yotze this one mitzvah. I read in the book about the steipler zatzal that someone asked him on purim after he drank .and he gave an answer that he wouldnt have given otherwise I think they asked him if he knew more torah than another gadol and he said i think i know a little more.i forget the exact words but it was something like that. thank you for having the guts to say the truth.But did rav shmuel really say that.I remember hearing from rabbi belskys own mouth (at the time of the shaitels made in india problem)that he read about himself that he went to india to see the problem and all kinds of things like that .When it wasnt true at all. I think that it is very simple: if you think that the Rav is saying that everything that has been done until now is wrong, you are not understanding him properly. I would venture to say that he would hold "יש על מי לסמוך" IF ONE MISTAKENLY DID SOMETHING INCORRECT: that is the definition of the term. There is no real difference between nowadays and previous years in halacha, however the metzius is called niskatnu hadoros, and regardless of what has been done in the past, nowadays it is definitely assur to become inebriated. I will grant that the Rav's explanation does not seem to be the poshut pshat, but the Torah does not tell people to do things that are dangerous - physically OR spiritually. It seems like you are advocating interpreting texts of the Torah as a means to an end. If interpreting the Torah correctly would result in people having "an all out excuse to get drunk and make fools of themselves as well as throwing up in other people's homes” would you be ok with that? Don't you think what the gemara really meant is more important than your opinion of what accountable and responsible is? Reb Moshe Feinstein once responded to a person who belittled a Talmid Chacham, by saying to this person, "You are pasul to eidus". He would have said the same thing to you. ok fine!!! but reb shmuel berenbaum ztv"l used to say "oif purim dus is nur ad delo yoda ubber simchas toirah trink un trink un trinks!!!" in english that means on purim its just until ad delo yoda but on simchas torah u drink and drink and drink! i dont wanna argue on harav kamenetsky but i dont think we will burn in hell for being soimech on reb shmuel berenbaom st"l!!! Yes, if it could be shown that Chanukah lecht were causing the deaths of many yiddin, any responsible posek would assur them just as Rav Kaninetsky has assured intoxication on Purim. He is right, the others are wrong!! Deck mishaps and Chanukah fires are rare and are preventable with care and planning. Dangerous health problems area direct effect of being drunk and are in a different category. The vehicular risks can only be prevented by tying the person up so they do nothing stupid. First be mekayim all the other mitzvahs before becoming fanatic about being drunk on Purim. L'besumeiBosem is a chiddush? If that is a chiddush then people have been unable to read and understand LaHa"K for generations! Oyah! That being said, thank you Rav Kaminetzky for alerting the public to this grave danger and exhorting all of us to enjoy Yom Tov responsibly. FWIW, if the Rav's words cause one less allegedly responsible adult to collapse in his own filth and vomit in the middle of the street then it is a great success! I think Reb Shmuel's statement was obviously taken out of context. If he was talking about Rabbi Horowitz, he was probably talking about the people and situations Rabbi Horowitz deals with at YES. And I don't think Reb Shmuel has a Pesach cruise. The Mishna brurah says clearly that drinking to the point that you miss doing mitzvos is assur. Rav Kaminetzky Shlit"a didn't make up a new pshat. Becareful when making letznois of the Rosh yeshiva! Rav Shmuel is Paskening like the Shittos that Assur drinking and he's informing the public of his Psak. Each person should now go ask their own Rav. I personally think the drinking on Purim, especially in Yeshivos, is an annual Chilul Hashem but the Rebbeim and the Roshei Yeshiva don't have the power to stop the Bachurim and it's just spun out of control. This then carries over to the Baala Batim who have graduated from the Yeshivos and try to recreate their Yeshiva days. I think for the most part people drink so much as an excuse to escape from their anxiety. Rav Yaakov Weinberg zt"l said a similar Pshat in Libisumei - he said it meant to be festive, to celebrate - which means with a little wine, a little joking, etc. - not to get drunk.- maybe just a little uninhibited. Rav YM Kulefsky zt"l when he was Rosh Yeshiva of Ner Yisroel Paskened like the Rishonim/Achronim that is was Assur to get drunk (I believe that was the Lashon - Bais Ephraim and the Bach? Rabeinu Ephraim?) It's a fact that drinking goes on and I'm embarrassed about every year. I look at the scene of drunks and think to myself, "Does it make sense that this is what the Ribono Shel Olam had in mind?" First of all, there is no Halacha like this. Second, there's a mitzva to drink wine and only wine because wine is a drink that lifts the soul. Other alcohol beverages make men into pigs. In fact, in the beginning of the megilla, achashveirosh encouraged everyone to dring and keep drinking. I cant imagine this is behavior/message we are supposed to get out of the story. Drunkeness is a disgusting thing. We can learn that from Noah. Great. Now people like those who commented here are going to drink on Purim and be over Rav Kamintesky's psak...BMEZID! “ You imply the Rabbonim in the past didnt know what they were talking about when they said it meant to get drunk literally. “ If our Rabbonim can take such liberties, what is our argument against Reform rabbis? only sniffing the wine.what are you a kairite? I listened to the telecast last night and was surprised how much focus was put on the Halachic view rather than how dangerous, how potentially life threatening drinking can be......especially for teens. One of the speakers mentioned that the teens need more time consuming activities. Well? Thats only partially true. Drinking is but a symptom of the real problem. Stuffing the problems through sports, art, entertainment isn't as bad as drugs alcohol, but nevertheless, the core issues aren't being addressed. How do you get a teen who's suffering internally to talk about core issues? Come at him/her at their level. Not as a rebbe or any other authority figure. The best people to talk to these kids are adults (like myself) who have suffered through alcoholism as a teen and now as an adult is sober for years. I don't understand why R. Kaminetsky had to go engage in linguisitc sophistry to reach his conclusion that people ought not drink to excess on Purim. First there is the interpretation of the Rema which could have more easily been emphasized than distorting the plain meaning of the text; drink a small bit more than one is used to and go to sleep. When one sleeps he doesn't know the difference between Haman and Mordechai. Secondly, even if one adopts Rashi's view of l'hishtaker (I believe that Rashi said with wine only becuase he was a vintner, and wine was probably the alcoholic beverage most readily available to him), like any mitzvah it should be practiced if it is safe to do so. In 2010 America, it is not safe for young boys and men to get drunk, and therefore once should not do so. I think he is right concerning under age drinking.But once someone is of the legal drinking age(there is wisdom to be found in the nations) then he must get drunk. The best way to deal with these issues is to first RECOGNIZE that there are issues and stop sweeping them under the rug! According to other meforshim, this is a dochak, because whenever the gemara brings a maaseh after a halacha, it is always to prove the halacha correct. The gemara there doesn't come to a different conclusion on the daf. It's not so poshut. for a novel approach to this gemara find a copy of the sicha of the Lubavitcher Rebbe on purim תשמ"ד. He explains this gemara without deviating from the p'shat which implies actual drinking and that Rabba actually shechted R' Zeira and how it wasn't a bad thing. The shulchan oruch gives clear guidelines of who should drink and who shouldn't. If a yid cares about ה', then they will follow shulchan oruch. Are you kidding me? Roshei Yeshivas don't have the power to stop Bachurim? Oh yes they do! They kick bochurim out for less dangerous behavior than that. If getting drunk really makes you happy you really have a problem. i have nothing against the rav, but for 1000 years rabbis have been saying that getting drunk on purim is proper. of course he is a great great rav but who is he to contradict all those before him and say that getting drunk on purim is an aveira? If we could just put aside our ta'avah to drink and the learn the sugya like any other in Shas we could come to a clear conclusion. The Rema writes that one can be yotzei by drinking a little more wine than one is accustomed to (like 2 cups instead of 1). The Mishnah Berurah quotes the Pri Megadim that everyone should follow this Rema. That's it, case closed. For some strange reason we follow every Mishnah Berurah but when it comes to drinking we totally ignore the heiligah Rema and Chofetz Chaim and prefer to act like animals. Don't let your ta'avah cloud your view of what Hashem really wants from you! No you should stop building illegal decks that are unsafe to stand on or build a sukkah on, or stop building sukkas on decks that are unsafe!!!! And you should be responsible enough to watch your lecht and keep them in a safe place where they won't tip over and the children can't go near them. Same as drinking on Purim, don't overdo and over exaggerate the halacha or the shiur. Every mitzvah should be done with careful thought and responsible action. Know what you are doing and do it l'shem Shamoyim and not as an excuse to do something that is otherwise unacceptable. If any of you show up on my doorstep rip-roaring drunk, the most tsedakah you'll get is the mother of all lectures on substance abuse. Staggering around the neighborhood like idiots sets a HORRIBLE example to our kinderlach. Don't think you can justify your irresponsible behavior with halacha. It starts with Purim and continues at Shabbos Kiddushim and at Chasunas. Once it starts it doesn't stop. Look at our young couples today, everyone knows the name and prices of the best liquor on the market and they wouldn't even touch what WE considered choshuv because it is too cheap for them. They would never make kiddush on just grape juice or wine, they have, excuse me that should be capitalized they HAVE to have mashkeh and their children see it and learn from it. Maybe not but they do say things they shouldn't. Ask the wive's what comments come out of they drunken husband's mouths, or even who they spoke to that they shouldn't have. Ask children how many times a drunken yid offered them booze to bring them to their own level of ad shelo yodoa. Ask a tired wife how she feels packing up all the children and dragging them to the car after the seudah and then having to drag their husbands or have someone drag their husbands to the car and drive them home after they had to prepare and deliver shelach monos, and take care of cranky kids all day while their husbands had their fun happily fulfilling their mitzvoh. Any woman who says she is happy her husband is drunk is lying for the sake of shalom bayis. Actually, to the contrary, out of all of the addictive substances, using alcohol in excess is the most damaging. For instance detoxification from alcohol must be done under medical supervision as it can lead to death, while the detoxification process from heroin, a much more stigmitized drug, while quite uncomfortable, is not life threatining. Livsumei does not mean drunk. shikur means drunk. livsumei is a state of "intoxication". Intoxication does not mean drunk, it means to be in an altered state of consciousness. One can become intoxicated through numerous mediums, happiness can be intoxicating, love can be intoxicating. b'samim can be intoxicating. Rashi, defined livsumei as "Al Hayain" which could be interpreted to mean that only wine can be used on Purim (NOT vodka, beer, whiskey, scotch, etc etc". However the participle Ha before the word yaim needs to be looked at. Rashi does not write Al yain but al hayayin. Mekublim have only one reference to Hayain, THE wine, which is the wine of the Etz Hachaim, from before ma'aseh bereshis. 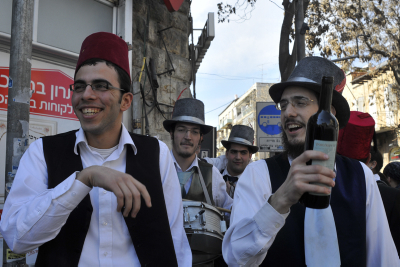 There is no mitzvah to get stupidrunk on Purim. Do you even know what a Karaite is? Karaites interpret the Torah shebaal peh literally (hence Kro-im mloshon mikra) and do not respect Rabbinic interpretation and takkanos. They do not celebrate either Chanuka or Purim for that reason. If the chazal could not have anticipated the problems with excessive drinking on Purim, why is it such a big deal for a Gadol with the stature of Rav Kaminentsky to paskin that whatever they may have believed hundreds of years ago is no longer relevant and we must now follow new rules. He can do it respectfully without saying the Chazal were "wrong"; just that the minhag must change with the times. I am mocheh at the bizayon of the one of the gedolei hador from your keyboard. Terrible chutzpah. And your facts are wrong as well. Rav Shmuel shlit"a, in addition to being a godol in his own right, is also the sone of of a great godol, Rav Yankev zt"l.
You need to do teshuvoh. Did you perhaps start doing your pshat in ad delo yoda a few weeks too early and type while intoxicated? I'm not saying wether or not I think an adult man should be drinking on purim, everything needs to be done with shechal. Perhaps allowing your young son to see you drunk and out of control is NOT the best idea in such an awful time period. We all know the dangers our children are up against. PLEASE, just think before you do something this purim! R Noach Weinberg used to stand and say l'chaim, over and over, and say arur Haman l’baruch Mordechai until he couldn't say it straight. This is the problem with litvishe rabomim, they think because their semicha is more strenuous than a MO or the Chabad bsic semicha, they can go around and say getting drunk on torah is hepech the torah. just because you're rosh yeshiva of a sub par yeshiva doesn't mean you can say rashi, rambam and MINHAG YISROEL are hepech torah!! Once again I don't believe any of these "Rabbonim" are learning lishmo bclal other wise they would have more covod for RASHI which is poshut emes !!! Doesn't lbsumei mean to "become happy" as in Koheles Rabba 11;9 or B.R explaining the name Bosmas? “ I am mocheh at the bizayon of the one of the gedolei hador from your keyboard. Terrible chutzpah. And your facts are wrong as well. You are right of course. I have met R' Shmuel a few times and it is clear that anybody who questions his yiras shomaim or koach HaTorah is plain nuts and not worth arguing with. Having said that it cannot be disputed that for over 2000 years it has been the minhag of gedolei yisroel, chassidim and anshei maaseh and so on to get drunk on Purim. Probably the best solution is for each of us to ask his own Rov. Obviously R' Shmuel's talmidim are duty bound to obey him unquestioningly. Afilu oimrim al smoil yemin uyemin smoil. Mishna brura has been around for a while. Chofetz chaim states "kodem shenishtaker". i guess that means before you sniff! l'chaim! to that. Having learned in Philly years ago I can tell you that every Purim most of the boys were drunk. In fact many times I was in Reb Shmuel's house on Purim and most of the boys there were drunk. Reb Shmuel looked on very amused. tell this to all my chushiva rabbeim who have been getting plastered for years and years. I cannot stand these public notices about this. BE SAFE. but drink. “ You are right of course. I have met R' Shmuel a few times and it is clear that anybody who questions his yiras shomaim or koach HaTorah is plain nuts and not worth arguing with. Well 2,000 years ago people were "oleh b'regel" do you want to try that? We have learnt alot in 2,000 and have realized that being lenient on this issue and allowing it to go as far as it did has brought us too many casualties. In addition, you can't even compare the level of yiddishkeit that we are at today to those of our former gedolim and their talmidim who didn't look for any and every excuse to drink and get drunk. Sometimes you just have to take the mitzvah at its simplest form and stop reading into it what you want to read into it. Is anyone disputing the fact that the mitzvah is actually to drink "wine" at the seudah and not the night before or all day long????? Or later at the purim chagigah? So let's get perspective here. Anyone who makes l'chaim all day long has taken that on as their own minhag and interpretation that does not make it the halacha. There is factual difference in what constitutes sakanah today, and our gedolim must take a stand on that. One of Reb Shmuel's statements was that the very interpretation that livsumei means getting drunk is itself an aveiroh. That is not something that is a current development, and a quick review of the poskim indicates that there was NEVER a halacha to get "drunk". It was to drink to achieve a physical component of simcha, not sloppy drunkeness. I am not amused by the naysayers who wish to claim that Reb Shmuel was changing or being mevatel a minhag Yisroel. Nothing close. Just that there are way too many who mistakenly believe they are being mekayem the halacha by fulfilling their own personal wish to get "smashed". Reb Shmuel says that this is not the halacha, and it is an aveiro. It could be that you can be yoteh the mitzvah as the RY suggested, but surely the mehadrin min hamehadrin (the more stringent who enhance the mitzvah) would be moisef v'holech (continue onward to add in quantity and quality of the drinking). I am mechanech my children in this mitzvah from age 6 - as I was in der alte heim (old country back home), an B"H es shat zay nisht (they are not badly affected from this annual drinking). "Having learned in Philly...." What in the world did you learn there? How to drink? We don't need yeshivas to teach bochrim to get shikkur. I hope u don't drive. This is clearly an example like many others of Rabbis "kvetching" whatever pshat they want into the halacha in order to stay politically correct. This business of making fun of roshei yeshivos is disgusting. Who are you people to disagree with the rosh yeshiva? The orsh yeshiva stated clearly the root wrod and explained pshat and you have the nerve to make all the comments. Why doesn't thie editor on this site moderate this site a bit better and refuse to put on any comments that are dergitory towards rabanim and roshei yeshivos? when people plan to drive a car and that is a sakanah and against the law. “ Well 2,000 years ago people were "oleh b'regel" do you want to try that? We have learnt alot in 2,000 and have realized that being lenient on this issue and allowing it to go as far as it did has brought us too many casualties. I have myself in the past 10 years been by truly great gedolim who were real shikkur on Purim. Their talk was almost like ruach hakoidesh. It appears to be a case of nechnas yayin yotzo soid. Also how many heimishe yidden do you know "look for every excuse to drink and get drunk"? the Rav refers to those at risk. ask an ex-addict and he will tell you that no one ever become an alcoholic from drinking on purim. No One. i think in sch a time, and such situations it is our obligation to get the advice from ex- addicts with many years of sobriety who leads a life of torah and yirat shamayim, and they are out there. indeed few but are exists. i know that no "professional" can relate and understand addicts, only ex addict can. and maybe r shmuel, r yakov horwitz should ask those poeple for an opinion. “ Do you even know what a Karaite is? Karaites interpret the Torah shebaal peh literally (hence Kro-im mloshon mikra) and do not respect Rabbinic interpretation and takkanos. They do not celebrate either Chanuka or Purim for that reason. if you're gonna be so indignant and insulting, at least be right. not quite sure how one would interpret torah sebaal peh literally. i think you mean torah shebichsav. obviously R' Shmuel is a rosh yeshiva and deserves respect. but why is disagreeing with him disrespectful, especially with shroshim in har'rei kodesh! many of those who disagreed in comment did it respectfully. please rebut them not the others. and please rebut them. im not certain it can be done. we aren't christians, what holy people say is to be digested and debated, not taken like sheep. "dor dor v'dorshav...dor dor v'chachamav." In every generation hashem places specific leaders which are tailor made for that specific tkefua since sheshes yemei bereshis. "Yiftach b'doro k'Shmuel b;doro" and the right to darshan and guide based on torah values and ideals...with the mekoros supporting their assesment of the present needs of that tekufa are in their hands. ( if you ask whats the difference between this and reform doctrine i say there is an answer;however this is not the forum for it, neither is that question an answer to invalidate the above stated yesod) One may not like/appreciate/agree the rosh yeshivas statement, but must frame it in the proper system of the understanding of our leadership for the past many thousand years. (Mordechai was mevatel many mitzvos doraissa and derabbonon while being gozer a 3 day tzom on pesach!...imagine what the bloggers were saying then!) May Hashem guide us and bring only shalom and bracha to ll of klal yisroel. a freilichen purim to all! Why do we make a brucha motzei shobbos "borei minei bsamim?" Perhaps for the same reason the Rav Kaminetzky is stating. The Rav is making a big chidush. I need to think about this more closely. Does anyone know if the Noam Elimelech has a peirush on this inyan? I would love to learn what he was mechadish on Purim. Rav Shmuel Shlita is really not being mechadeish something. Anyone who ever learned by Rav Pam zt"l knows that his Purim chagiga had no holilos and he did not appreciate bochurim getting shikur and acting like drunken fools. He would be totally serious and would hardly crack a smile. He would sing a special purim niggun that was quite somber. But the bottom line was you felt the kiddusha just being there. “ It could be that you can be yoteh the mitzvah as the RY suggested, but surely the mehadrin min hamehadrin (the more stringent who enhance the mitzvah) would be moisef v'holech (continue onward to add in quantity and quality of the drinking). "B'H es shat zay nisht." Ah nehkhtiger tug! The drinking is disgusting. for the rest of us. It would be wise to refrain from drunken driving this Purim. It's never acceptable to open yourself up to public ridicule and bring disgrace on your parents and family. Look how disgusting the goyim are on St Patrick's Day. End of story. Happy Purim. How do you know what is pleasing to Hashem? That is how reform and conservative heresy started, i.e., "oh I know better than Hashem, when he says don't eat pork, I know he doesn't really care, I mean come on, that makes no sense." We have a torah that tells us what hashem wants, maybe his intellect is higher than yours that you won't understand all the mitzvas, but our rabbis laid out what hashem wants. and al pi shulchan aruch and the rov one has to say l'chaim. one should reach the level of Gorel, like the posuk says, "koru hayomim haele purim, al-shem ha pur", named after the iker hanes Haman wanted to bring out the level of gorel to a point in which jews and goyim are equal, where no choice is more likely than the other. Indeed that's what happened and the aybeshter still chose us. when we say we are chosen we are refering to being chosen on the physical level, because free choice doesn't exist on the level of neshama, there the jew is clearly superior, and the choice would be forced civiyochal, rather G-d chose us here on the level of gorel. and that is why we are b'simcha, don't listen to this misnagid, Zog l'chaim and don't be m'vatal a mitzvas ase. “ How do you know what is pleasing to Hashem? That is how reform and conservative heresy started, i.e., "oh I know better than Hashem, when he says don't eat pork, I know he doesn't really care, I mean come on, that makes no sense." We have a torah that tells us what hashem wants, maybe his intellect is higher than yours that you won't understand all the mitzvas, but our rabbis laid out what hashem wants. and al pi shulchan aruch and the rov one has to say l'chaim. about reform. You apparently belong in reform school. "Oybeshter chose us..." Yes, but not to act like degenerates. You defend drunken rowdiness? You talk about listening to your rabbis? What about Rabbi Kamenetsky? Is beard is not long enough for you? Tipish! teach you to get smashed. That's not yiddishkeit. I hope you don't plan to drive. “ Livsumei does not mean drunk. shikur means drunk. livsumei is a state of "intoxication". Intoxication does not mean drunk, it means to be in an altered state of consciousness. “ obviously R' Shmuel is a rosh yeshiva and deserves respect. "First there is the interpretation of the Rema which could have more easily been emphasized than distorting the plain meaning of the text; drink a small bit more than one is used to and go to sleep. When one sleeps he doesn't know the difference between Haman and Mordechai." This is exactly what the Rav of the shule where I grew up many years ago told me. He still does this, and I have adopted this interpretation myself. We once found a bachur on our front lawn throwing up, then sleeping next to the mess. I brought my (then) young kids out, and gave them an object lesson in what happens when a person gets drunk, and what it looks like to other people. B"H they have never found the need to get drunk! Once again an am aretz with no bittul. I bring sources from Toyruh and you say, avoiding rowdiness is what hashem wants? that sounds like reform suday school, read halacha. Whats wrong with Rabbi Kamenetsky? he has no standing and no right to say rashi, the rambam, Chofetz Chaim and Shulchan Aruch are wrong, and more than that say they are hepech to torah, RACHMANA LITZLAN! Read the story of rabba and R' zeira with rashi. the fact that rabba invites him to get shiker again is what shows that the mitzvah still exists. Further more it's been the minhag tzadikim and yisroel for thousands of years, This rabbi sits in his yeshiva all day while people worship him and he gets a big enough head to think he can overturn rashi CHOS V;SHOLOM! with his shreklikhe chillul Hashem. "What's wrong with Rabbi Kamenetsky"? or engage in hoylilus. You should get a job. you're capable of understanding anything. af-feern vee prusteh menshen mit mashkeh ah gantzn purim, nebekh. indoors and don't drive drunk. You can get arrested. just by the way he actually mentions the maasa and says that after that they almost completly got rid of the mitzva! maybe there are people greater than you that know a bit more! besides the fact that he was very badly quoted.